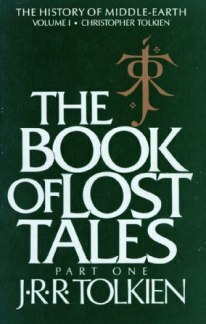 The Book of Lost Tales, Part One was released in 1983, the first volume of what would eventually become the twelve volume History of Middle Earth. The Book of Lost Tales, Part One is comprised of a collection of the very earliest tales of Tolkien’s created mythology, begun in late 1916 – early 1917. In this volume, readers of The Silmarillionwill find much that is familiar, but much more that is foreign. Tolkien revised continuously, and constantly abandoned tales, themes, ideas, and names along the way. While some of the stories are similar to their later “finished” versions, many others are almost completely unrecognizable. To further complicate the issue, Tolkien often changed names (sometimes several times) during the writing of a manuscript. This can at times cause puzzlement. Christopher Tolkien’s running editorial commentary on the ever-shifting names and versions helps to quell the confusion. “The Cottage of Lost Play” was one of the earliest of Tolkien’s writings of Middle Earth. Its purpose was to provide an introduction to the other “Lost Tales” – a structure, so to speak, through which the tales could be told. “The Cottage of Lost Play” begins with Eriol (whose name later becomes Ǽlfwine), a man, visiting the isle of Tol Eressea, the isle of the Elves, where he seeks lodging for a night. The “lost tales” are then related to Eriol through Lindo, a loremaster of the elves, who tells the forgotten history of the elves and Middle Earth. The rest of the tales in the book are related in this way, as a history told to Eriol at the “Cottage of Lost Play”. These tales included much that were later revised heavily and became part of The Silmarillion, and much that was later amended or completely abandoned. Christopher Tolkien provides a fairly extensive commentary at the end of each “section” of the book, detailing facts about name changes, the history of each piece, and its final place in the mythologies. The Book of Lost Tales, Part Two continues the tales where they are left at the end of Part One.